Since I’m working on a longer project I’m posting this preview to show everyone that I’m not disappearing already, it always takes time to create stuff! 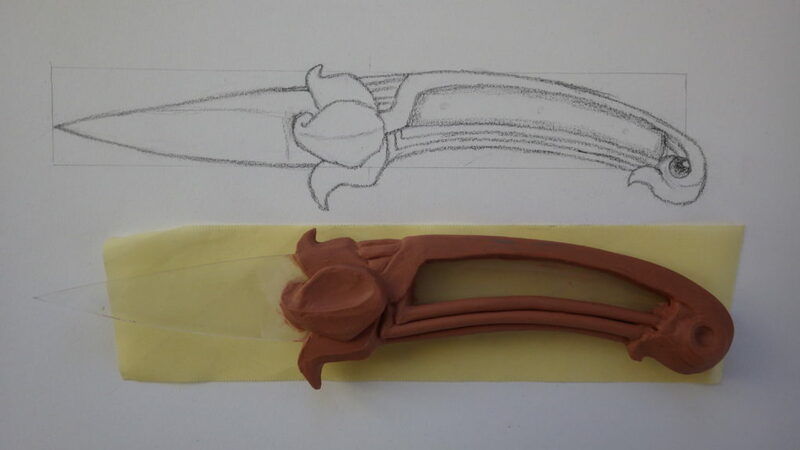 This is the model for an Art Nouveau knife, the transparent plastic holds the place for the blade, that is important not only to get a clear idea of how it looks while modeling, but it’s useful when making the mold too. The material used to model the handle is Chavant NSP (no sulphur plasteline), the final handle will be cast in aluminium-bronze, a golden colored alloy that was used for decoration purposes in Art Nouveau and much more in Art Decò, and nowadays is used for special applications like boatbuilding and non-sparking tools for its special qualities. The sides of the handle, that now are empty, will be filled with mahogany inserts (Sapele really, for the experts out there), and the hole at the end of the handle is there to be filled with a garnet cabochon. In the next days I will publish instructions on how to build the various bits that I still need to finish it, I hope you’ll enjoy this project as much as I do!